Locked in a tight game with the Detroit Pistons earlier this week, the New Jersey Nets found themselves up two points with about five minutes left in the fourth quarter. Looking to score and make it a two-possession game, Deron Williams brought the ball downcourt. Even though Williams was the point guard on this play, it was designed for him to work away from the ball. 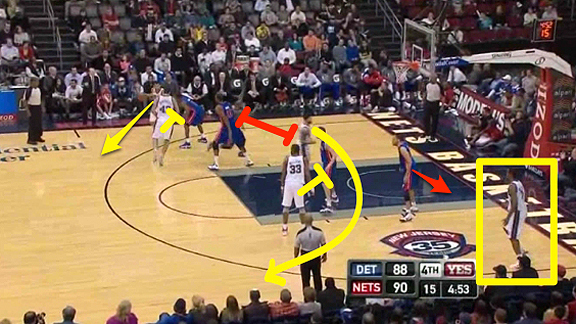 This misdirection, along with smart player positioning by Nets coach Avery Johnson, allowed New Jersey to get an open 3-point look. After crossing the half-court line, Williams passes to Jordan Farmar on the wing. Farmer extended high above the 3-point line to make sure he got the basketball, because if the pass was denied, the play would have been stopped dead in its tracks. Once Farmar receives the ball, Williams uses a Kris Humphries back screen at the elbow. The first option here is for Williams coming off the screen, but that isn’t the option Avery Johnson wants. That first look is more of an “If it’s open, hit him” option. If Williams isn’t open, just keep running the play. As Williams runs off Humphries’ screen, Shelden Williams positions himself on the weakside elbow and Shawne Williams runs to the weakside corner. 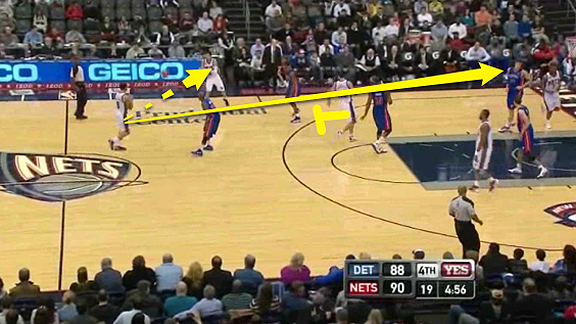 As Deron Williams cuts to the paint, we see why that initial back screen was important. Look at the space between Williams and his defender, Walker Russell, because of the screen. Next, Humphries sets a ball screen for Farmar on the wing. As that takes place, Deron Williams cuts through the paint and uses a pin-down screen set by Shelden Williams. With all this happening, it seems like Shawne Williams is just lost in the corner, but that’s exactly what Avery Johnson wants. Williams is a spot-up shooter, and as long as he stays in that corner, his man, Tayshaun Prince, can’t leave him alone to help on Deron Williams. 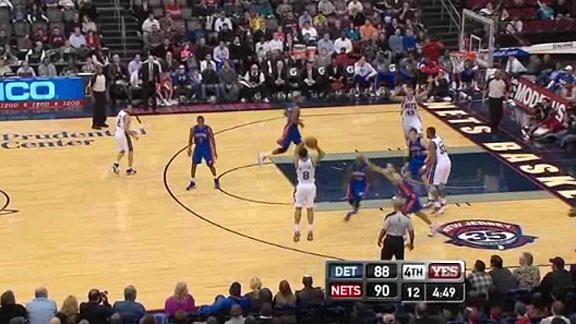 Shelden Williams sets a strong screen and Deron Williams’ defender gets stuck on it. Now, Prince has to decide if he will help on Deron Williams or stay on Shawne Williams. Because Shawne Williams is a good shooter from the corner, Prince hesitates and plays the passing lane, looking to steal a pass from Deron Williams to Shelden Williams. As a result, nobody closes out on Deron Williams, who releases his shot before his defender or Prince can get a hand up to bother him. Deron knocks down the 3 to give the Nets a five-point lead, and New Jersey goes on to notch its eighth win. 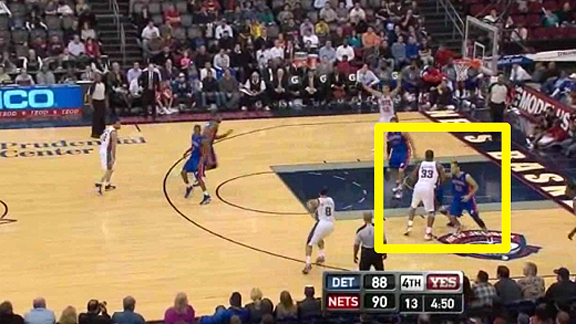 Avery Johnson wisely used all the strengths of Deron Williams on this play. We all know how dangerous Williams is with the ball in his hands, but he is also big enough and skilled enough to play off the ball. He’s also a good enough shooter that it makes sense to run him off screens away from the ball from time to time. It’s a nice way to mix things up, and as you see here, it can win games.